'Iron Tank, subtitled The Invasion of Normandy, known as Great Tank (グレートタンク, Great Tank?) in Japan, is a 1988 top-view shoot 'em up produced by SNK for the Famicom and the NES. This game is based on SNK's 1985 arcade game TNK III (which was released as TANK in Japan). It contains the same basic mechanics, as well as the same background music, as its arcade predecessor. 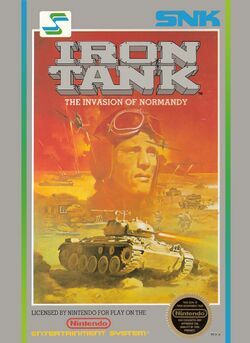 Set during the invasion of Normandy, the player takes control of a commando named Paul and codenamed SNAKE (Colonel Ralf Jones in the Japanese version, who also appeared in Ikari Warriors), as he mans the titular Iron Tank to infiltrate the German stronghold. Within PAL-A regions, it was only released in Australia due to the sensitive nature of the second World War in Europe. Like most Nintendo action shooters, Iron Tank is divided into multiple levels, with bosses at the end of each. However, gameplay is continuous; there are no breaks between levels as the defeat of one boss directly leads to the start of the next level. One unique aspect that separates it from other action shooters is the ability of the player choose different paths to the final level by driving down the path of his choice. Some paths have fewer but more difficult levels, resulting in a shorter game if the player can successfully negotiate them while others are the reverse. The paths break and converge at specific points in the game's progress, allowing the player to mix and match level paths as the game progresses. This page was last edited on 27 December 2013, at 04:43.